Joining the Cool Kids: Painted Mason Jars with Flowers! This post on Painted Mason Jars with Flowers originally ran on July 2013 but still remains one of my favorite mantel pieces. If you enjoy it, be sure to check out my other DIY stuff! I know, I know, all the cool kids are doing painted mason jars with flowers these days. So I didn’t create anything original, but I do love them and wanted to share them with you. 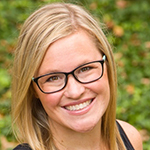 I was inspired by Linda from It All Started With Paint – she paints mason jars with Annie Sloan Chalk Paint, then distresses them. Talk about fabulous! If you don’t want to make your own, go visit her Etsy shop to buy a set of painted mason jars! 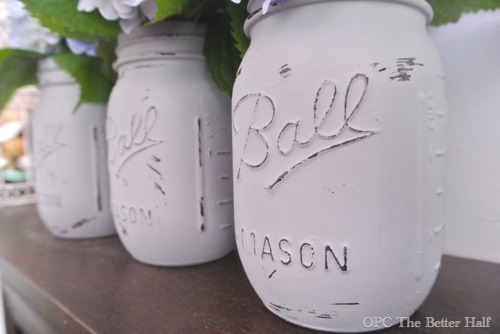 I didn’t use ASCP on my jars, although I do love Chalk Paint and made a painted mason jar for a friend using Old White. Instead, I used paint I already had for the room and added Plaster of Paris to help it adhere to the glass. I painted the whole exterior twice and let it dry overnight. The next morning I used my sanding block to distress the jars. Seriously, it was that easy! Next, all I had to do was find some flowers. Fortunately, I was over my friend, Janell’s house a week or two ago and commented on her beautiful hydrangea centerpiece. They came from her garden, and she said I was welcome to take some home. I passed at the time, but this week I texted her and went over and stole some from her garden. I say “stole” because she was out-of-town, and it felt a little weird cutting a few off and running to my car. Fortunately, the cops didn’t come. lol. And now they sit pretty on my mantle. I’ve made some over changes to the room that I will be unveiling soon, so stay tuned. Btw, my friend, Melissa from the Happier Homemaker gave me a tip to help cut hydrangeas last longer! What do you think? 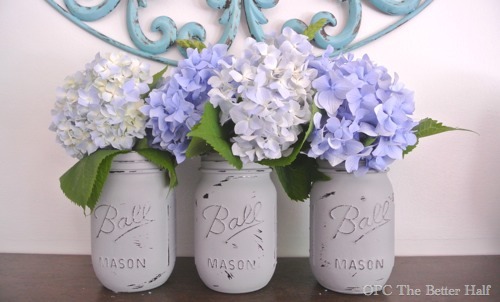 What color will you paint your mason jars? So pretty Jocie! What a beautiful display for summer! Pinned! They are so beautiful, Jocie! Looks GREAT! And I love those flowers too! Hi, I love these they are so pretty. I saw it on craft on maniac. Looks fabulous! So creative too. The white shows off the hydrangeas beautifully! Love it! I have loads of hydrangea blossoms in the front, so that alum tip is wonderful. Thanks! you are totally a cool kid now. 🙂 love them! So cute! Popular for a reason girl. These look beautiful, and the flowers are gorgeous!!!! (I had a neighbor loan me some too) Aren’t we lucky!! Absolutely gorgeous flowers 🙂 I love your mason jars – they are the prettiest one’s I’ve seen. 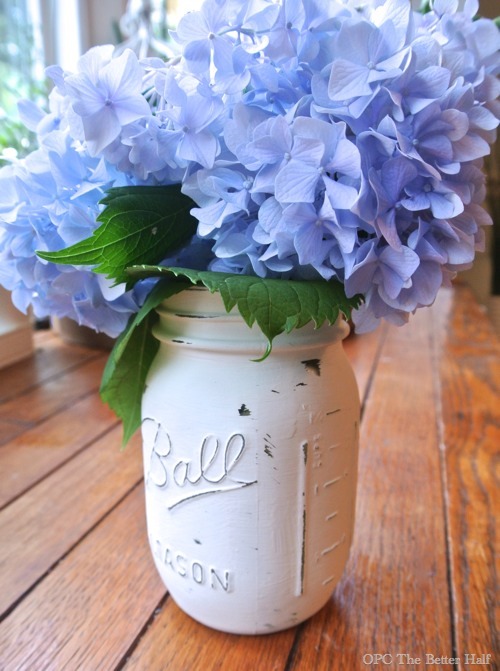 Hydrangeas are such classic flower that they look perfect in such a classic jar, paint or not paint added. These are great. 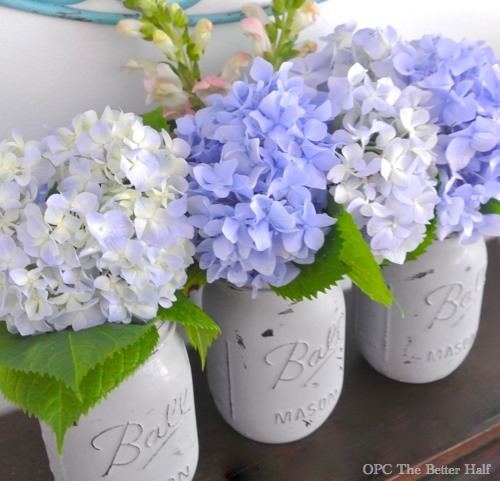 I have lots of old Mason jars tucked away that would be perfect for this project. These are really pretty. They remind me of something Rachel Ashwell of Shabby Chic would have on her mantel. Love it. THESE ARE BEAUTIFUL!! WHAT KIND OF PAINT DID YOU END UP USING? Those are gorgeous! I love them as a Spring table centerpiece. Hi Jocie, thanks for sharing these super cute painted Mason jars on our new All Things Creative FB page! 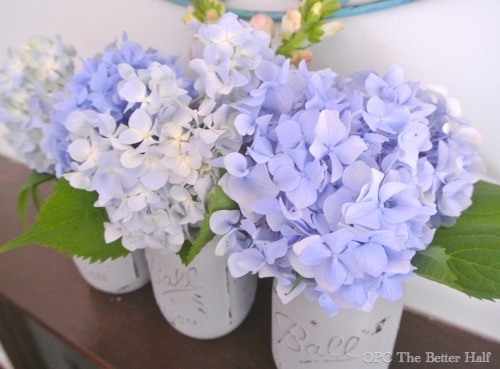 You have inspired me to paint some jars to get ready for some anticipated hydrangea blooms in the summer. I didn’t get many blooms last year because we had a severe winter (for the South!) Pinning!